Peng, in the Department of Biology, Faculty of Science, will receive $715,275 over five years to study “MicroRNA-218s and their regulated signaling networks in placental development and preeclampsia“. Preeclampsia (PE) is a major disorder of human pregnancy, characterized by high blood pressure and presence of proteins in the urine. It is the leading cause of maternal death and still birth, and also affects the health of mothers and children later in their lives. The cause of PE is not well understood; however, Peng’s research has discovered that microRNA-218 (niR-218) levels are lower in placentas of PE patients than those of healthy women, and that miR-218 regulates various activities in placental cells. These novel findings suggest that miR-218 plays important roles in maintaining the proper development of the placenta and that insufficient production of miR-218 in the placenta contributes to the development of PE. The major objectives of this grant are to further investigate the role of miR-218 in placenta development; to identify which key molecules are regulated by miR-218; and to determine how abnormal production of miR-218 may lead to PE. Chun Peng (Biology) was successful in obtaining two CIHR operating grants for the following projects: 1) “cyclin G2 in ovarian cancer development” and 2) “Modulation of Nodal signaling pathway by microRNAs and their involvement in preeclampsia”. Chinese Canadian Legend recognizes and honours Chinese Canadians who have made significant contributions to the community and Canada through outstanding achievements in their field. York University researchers have zeroed in on a genetic process that may allow ovarian cancer to resist chemotherapy. Researchers in the University’s Faculty of Science & Engineering studied a tiny strand of our genetic makeup known as a microRNA, involved in the regulation of gene expression. Cancer occurs when gene regulation goes haywire. “Ovarian cancer is a very deadly disease because it’s hard to detect,” says biology Professor Chun Peng, who co-authored the study. By the time it’s diagnosed, usually it is in its late stages. And by that point there’s really no way to treat the disease. Even when the disease is discovered in its early stages, chemotherapy doesn’t always work,” she says. Biocetera, NewsRX, BiomedME, The Free Library.com, aalaTimes, MedIndia, Rust-tele. This year the Faculty of Science and Engineering presented researchers with Internal Research Awards to acknowledge the research achievements and dedication of various faculty members. A world expert in the area of ovarian cancer and the molecular basis of complications in pregnancy, Professor Chun Peng from the Department of Biology is the recipient of the 2010 Established Researcher Award. Dr. Peng’s track record of awards and publications demonstrates the strong and superior research program and team that she has created at York University. 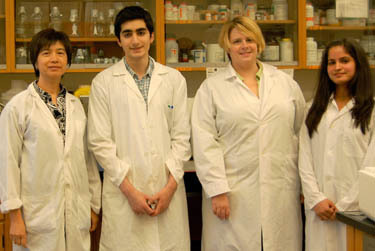 Professor Chun Peng’s laboratory in the Biology Department has also been bursting with energy this summer as three NSERC USRA recipients have joined the group to pursue research projects in the area of cancer biology and fish reproduction. Eilyad Honarparvar has been investigating an important protein called p27 that plays a protective role against cancer. Michele Taffs, joined the laboratory to investigate the role of certain chemicals in disrupting the reproductive system. Tanita Manchanda, will be exploring the role of miRNAs in placenta formation and eventually in cancer development and treatment. The Ontario Women’s Health Council (OWHC) presented 27 awards on Jan. 20 during a ceremony at the Metro Toronto Convention Centre. 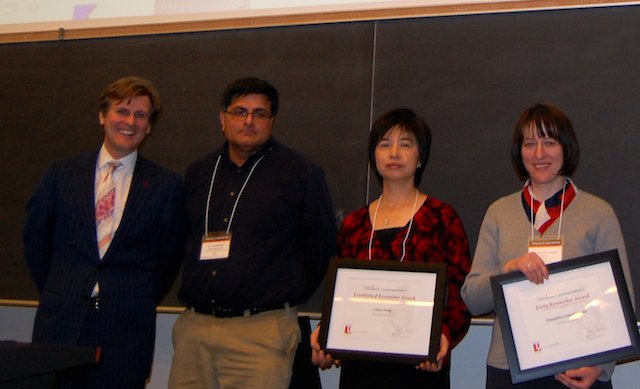 Two professors and three graduate students from York University were among the award-winners. Professor Chun Peng (left) of the Department of Biology, Faculty of Science and Engineering, received a Mid-Career Award for her research into the role of Nodal signaling pathways in ovarian cancer – among the deadliest cancers for women. PhD student, Guoxiong Xu, of the Department of Biology, a researcher in Peng’s lab, is also involved in work that may advance the scientific understanding of ovarian cancer. Xu received a Scholars Award for his research on the function and biological effects of a growth factor that may prevent the development of cancer cells. Five groundbreaking York University research projects will receive more than $1.6 million in grants from the Canadian Institutes of Health Research (CIHR) over the next three to five years. Among the projects chosen for CIHR grants was Dr. Chun Peng’s Lab. Biology Professor Chun Peng, Faculty of Science & Engineering, will receive $227,304 over three years for cancer research. Peng’s research will examine the nodal signaling pathways in ovarian cancer cells. 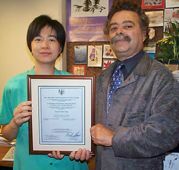 VP Research & Innovation Stan Shapson recently presented Chun Peng with a framed Premier’s Research Excellence Award certificate. The certificate was in recognition of her cutting-edge research in the areas of molecular endocrinology and female reproduction, especially regulation of ovarian and placental functions.